A Blood Donation Camp was organised at Changsari Military Station on commemorating the completion of 50 years of raising of the Red Horn Sappers. 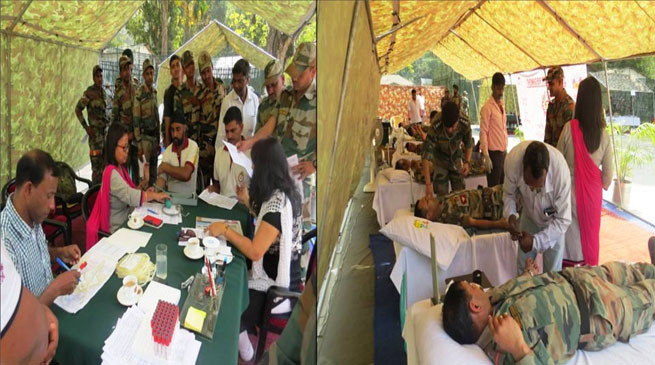 The Blood Donation Camp was conducted by doctors & representatives of Guwahati Medical College & Hospital assisted by medical authorities of Army. In first phase of the donation camp a total of 86 soldiers of the Regiment volunteered & donated their blood. Blood donation by serving Officers, JCOs& OR of the Regiment demonstrated the ethos & traditions of the Regiment which was appreciated by all. The second phase of the Blood Donation Camp would be organized in last week of March 2016.